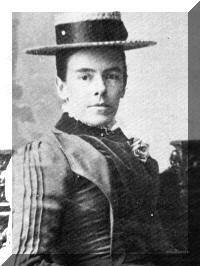 3-Sarah Ann Walker was born on 16 Feb 1870 in Exton, Tasmania and died on 16 Oct 1922 in Exton, Tasmania at age 52. Sarah Ann (Nan) their first child, was born on 16 Mar 1870 at Exton. After she left school, Sarah continued to help her mother with the children and whenever told she had another brother or sister would always say, "I aren't pleased". She meant she would have extra work to do. When at last some of the younger ones were able to help, Sarah left home and was companion help to the wife of the Westbury minister, Reverend Hambly. She later went to live with them at Camperdown in Victoria. It was whilst living there that she found she had cancer, and returned to Tasmania. Sarah had surgery but after some time it was found that the operation had not been successful. After some months of suffering she passed away on 16 Oct 1922 at age 52. Sarah Ann did not marry.